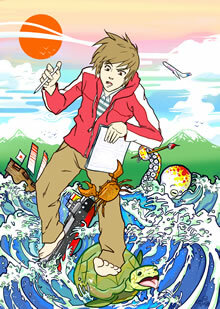 The Embassy of Japan in the UK is once again launching their manga-writing competition, MANGA JIMAN 2013, with fantastic prizes up for grabs. Now in its 7th year, MANGA-JIMAN can be translated as ‘having pride in manga’ and the Embassy of Japan is proud to offer this opportunity to UK manga creators. This competition is open to all UK residents aged fourteen (14)* years or over. All creations should be original and between six (6) to eight (8) A4-sized pages in length and drawn so that it reads from left to right. The manga should in some way make reference to ‘voyages of discovery’. We chose this theme because 2013 marks the 400th anniversary of the first British ship to arrive in Japan and 150 years since five samurai arrived in the UK, the first Japanese to study at university in Britain. NB Your manga does NOT specifically have to refer to these two events. 2nd Prize: A fabulous laptop computer from Toshiba of Europe Ltd.
Emma Vieceli is a member of independent manga studio Sweatdrop Studio and one of the top manga artists in the UK, she has illustrated books for Self Made Hero Press, a story in the Eisner Award Winning collection Comic Book Tattoo and had work published in many other books and magazines. If your library hosts a Manga Club then Dragon Heir will be an essential part of your collection, it will be proof for your young manga artists that it is possible that they can have their works published. Even if your library does not have a manga club this book is necessary, it is beautifully illustrated, cracking story that has been created, written and illustrated by a UK artist , so in purchasing it you will be supporting local industry and adding a brilliant book to your collections. Even if your library does not have a manga collection, Dragon Heir will be a good book to start your collection! Go on order it! You know you want to! This all sounds really familiar! Suppressing information, cutting access to books and people think it only happens in fiction! Guess not – who knew that manga could foretell the future? I like the idea of being a Book Soldier, the first shots in defending Libraries and access to books are being fired as we speak. Do we as librarians that work with young people have a duty to educate our Teens on how to protest the cutting of the EMA, provision of addresses of MPs, during the reading groups and activity sessions should we be able to run letter writing workshops to Parliament to protest the cuts. I am working on a how-to create a ‘zine programme that I will post up here soon, maybe even a workshop on protest sign making. The youth are already rising up, I think we have a responsibility to guide them on how to do it safely (and legally)! You can grab Library Wars from Amazon here or ask at you rlocal comic or speciality bookshop.